I mentioned Begonia ‘Fragrant Falls’ in my June newsletter (actually, the form now generally available is ‘Fragrant Falls Improved’). This is a tuberous type, with pendulous stems bearing huge double flowers. These begonias are ideal for a large hanging basket in light shade – such as the one I have suspended from a sturdy branch on my old apple tree. The basket’s chains are attached to a loop of sturdy wire around the branch, threaded through a short length of hose pipe to prevent the wire digging into the bark. The fact that the basket is in ambient light should ensure even growth all round – baskets on house walls receive directional light, so need turning regularly. The flowers are blowsy, but in pleasing shades of pink, cream and apricot – no strong oranges and reds. They have an additional, quite unexpected, attraction. Try pulling off a petal and eating it – they produce a fizz on the tongue, like space dust (cosmic candy) or a sherbet fountain. Flowering is some way off yet, so the plants will need plenty of feeding to encourage them to fill the basket. 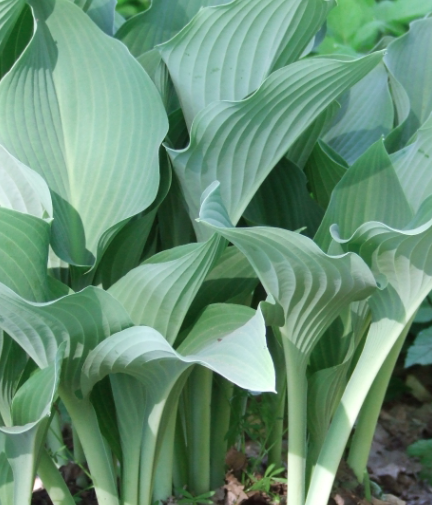 I was speaking to a group of gardeners the other day about slug-proof hostas. None is reliably so, but the blue-leaved types have a waxy coating on the leaves that the pests find less palatable. One of my favourites is ‘Krossa Regal’, a very distinctive plant. 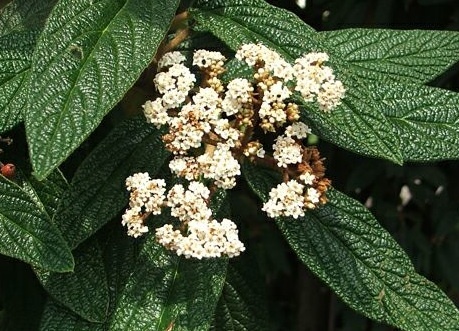 The leaves are large and pointed towards the tips and are held on rather longer leaf stalks than is usual. This gives the whole plant a unique, vase-like appearance. Since this is one if its most attractive features, I prefer to grow mine in a large terracotta pot (painted white), so you can really appreciate the elegance of its habit. I always cut off the summer flowers, which to me have little charm. I was quite surprised to find a couple of audience members nodding in agreement – this is normally met with disapproval! I’ve been asked to recommend some plants for a shady part of a garden, and I suddenly remembered Viburnum rhytidophyllum, a handsome shrub with rather an old-fashioned look to it. It’s a tough evergreen, with corrugated, thick green leaves with felty undersides. The heads of dull creamy white flowers are opening now – the whole thing is recognisably a viburnum but unlike any of the others. While it might eventually grow quite big (easily to 2 metres in both directions), it would tolerate pruning. No doubt it would be best in full sun, but my experience of it is that it is remarkably tolerant and could be expected to perform well in pretty much any situation. In shade it might get a bit leggy in time but I’d expect it to stay healthy and give no trouble. A versatile plant. 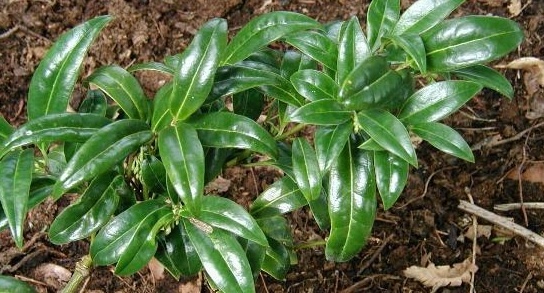 I referred to winter-flowering Sarcococca humilis (Christmas box or sweet box) in my March newsletter. Not entirely sure that this is the preferred name these days, but it’s the one I continue to use. The one I bought – quite a few years now – was labelled ‘Purple Stem’, which apparently belongs to a form of S. hookeryana var. dignya. Who knows? 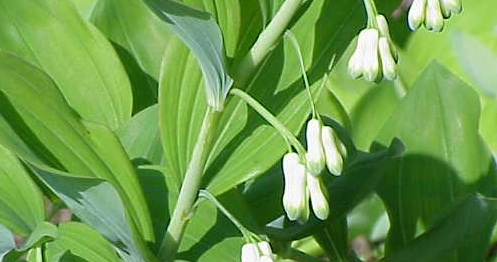 It’s a nice-looking thing, with its glossy evergreen leaves, but it does not do well for me, failing to make good growth though reasonably generous with its sickly-sweet (but tiny) white flowers. From a trawl of the internet, any problem appears to be solely mine, as other gardeners manage to have it thriving. It may be the heaviness of my soil that gives it grief – it’s reputedly tolerant of lime and shade (both of which it has in my garden). Books I have consulted are a little vague on the matter – perhaps someone can enlighten me?